This is my first attempt at any sort of nail stickers/apps/polish strips/whatever they’re called. I’ve been wanting to try them for a while, but since I usually have the urge to paint my nails every couple days whether they’re chipped or not, I was worried about my patience with these. But lately I haven’t really felt like painting my nails, and I had a coupon for these at CVS, so I decided to give them a go. I’m really drawn to their black and white patterns. I already own Love Letter, and love the black and white tribal ones, but I’ve been wanting to try these since they first came out. This patten is called Cut it Out. They also have some multi colored flowers that are similar if that’s more your thing. They were pretty easy to apply, though I did have a few issues. First, I did have some peeling immediately after applying, so I topped them with Essie Good to Go, which completely fixed that problem. Also, I ripped two of the ones on my right hand while applying, but managed to put them back together enough that it’s not really noticeable. Overall, I think my first attempt was pretty good, although my second try will definitely be better. They are really smooth and feel very secure on my nails. Although they’re made from nail polish, they feel a little more like stickers, which I actually kind of like. They’re a little pricey at around $7-$10 per box, depending on where you buy them, but it’s still less expensive than getting a manicure at a salon. 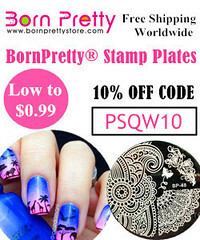 I think these are great for people who are hard on their nails and don’t have time to paint them multiple times a week. And these will be fantastic for vacations – you won’t have to worry about your polish chipping or coming off, at least for a week or so. And the best part? My nails are short enough that I was able to cut the strips in half and get two manis out of the box. You get 16 strips in every kit and I only used 5, so I have plenty for another whole mani and a few accent nails. That definitely makes these worth it in my opinion! What’s your favorite Salon Effects pattern? Or have you had better experience with another brand? Let me know in the comments!